From busy streets to incredible shorelines and nature, Ghana will impress you from the moment you step foot off the plane. The Coastal Plain, located in the South of the country, will show you a different side to the wildlife-filled Africa you’ve seen on postcards and TV shows. The city of Cape Coast, located at the Gulf of Guinea, is a major tourist hotspot, home to several beach hotels, restaurants, busy fishermen, and talented craftsmen. Cape Coast also offers a fascinating insight into Ghana’s past under British colonial rule, as it used to be the European colonial capital. 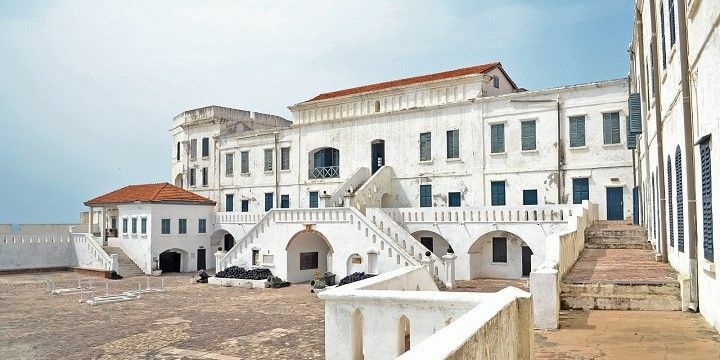 Cape Coast Castle is a former commercial fort and slave-trading center. Be sure to check out Cape Coast Castle, a former commercial fort and slave-trading center, from where slaves were sent to the “New World”. Take a guided tour around the castle’s rooms and dungeons to learn more about Ghana’s past. Home to Ghana’s only coastline, several stunning beaches are scattered over the Coastal Plain. The western Busua Beach is a great surfing spot, lined with many resorts and bars. The beach is located about 90 minutes from the twin cities of Sekondi-Takoradi, which also host several beautiful sandy stretches. Travel further east to find the white beaches of Anomabo and Elmina. Be sure to stop at the 600-year-old Portuguese Elmina Castle, which is the oldest European building in the area. 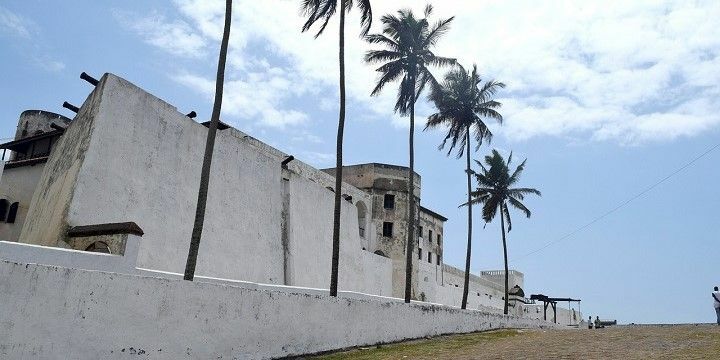 The Portuguese Elmina Castle is more than 600 years old. Additional beaches can be found around the capital, Accra. Hit up Labadi Beach if you’re looking for a lively party atmosphere, or Palm Royal Beach for a more relaxed vibe. You’ll be asked to pay a small entrance fee for both beaches, but it’s definitely worth it! Alternatively, drive about 40 minutes west of Accra to Bojo Beach, which is actually a small island. Surrounded by the Atlantic Ocean and the Densu River, it’s accessible by a short boat ride. 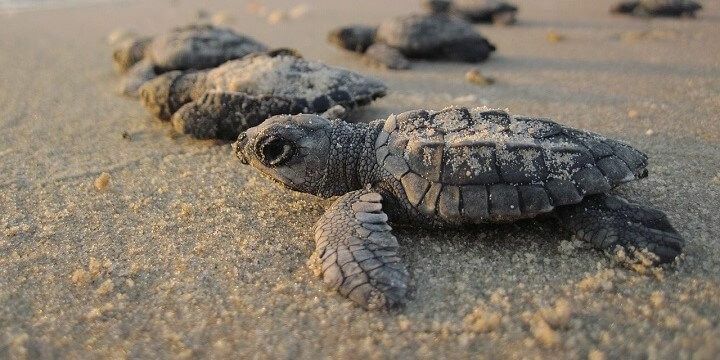 Ghana's Coastal Plain is home to marine turtles. The eastern region of Ada also wows visitors with its long, sandy beaches and small islands in the Volta River. The area is famous for its incredible wildlife, such as marine turtles and monkeys. Kakum National Park is located about 30 kilometers north of Cape Coast. Cross the 30-meter-high canopy walkway to take in Ghana’s unique natural beauty. The canopy walkway is open from 6:00 from Monday to Saturday, and it’s best to arrive as early as possible to avoid the crowds. 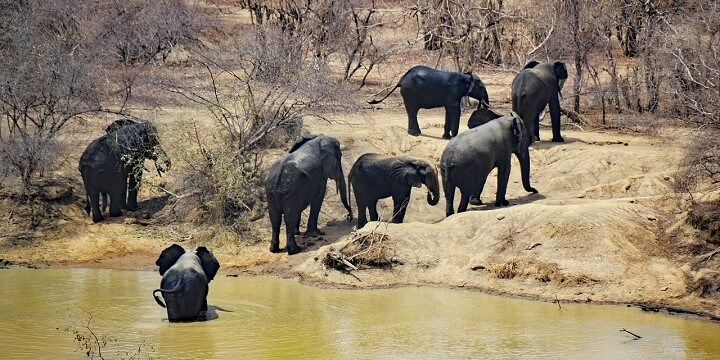 Book a guided tour to hear in-depth knowledge of the trees and wildlife from local guides, and to see an amazing selection of animals, including elephants, monkeys, and antelope. Kakum National Park is located about 30 kilometers north of Cape Coast. The sprawling capital city of Accra offers spectacular views from the SkyBar 25, West Africa’s tallest building. You might see some of the city’s bustling markets, such as Makola, where you’ll find items such as hand-woven fabrics to fresh ingredients. Try to visit Makola with a local to avoid getting lost in the maze of stalls. If you‘re looking for some local art, stop off at Arts Centre Market, close to the Black Star Square on the seafront. 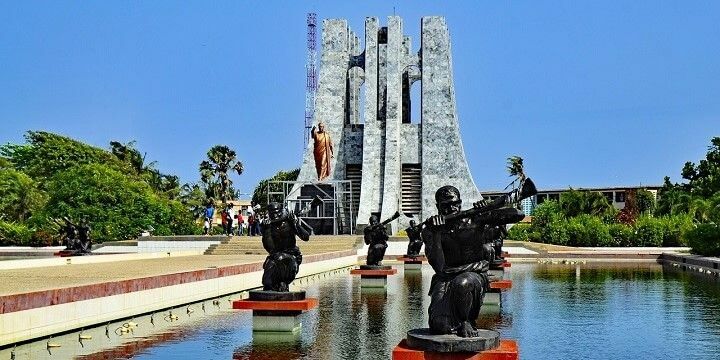 Black Star Square, also known as Independence Square, is home to impressive monuments, such as the Independence Arch, the Black Star Gate, and several memorials to fallen soldiers. It also hosts national celebrations, including Ghana’s Independence Day Parade on 6 March. If NextStop24 helped you to choose your next travel destination, we'd be very grateful if you’d search for your accommodation and things to do in Ghana through these links. They're affiliate links, which means that we will receive a small commission for every booking made through them. There are no extra costs for you; you'll simply be helping to keep NextStop24 running. Thanks! I went on a road trip along the coastline of Ghana, we drove from the capital of Accra as far along as Takoradi. The views along the way were incredible, we stopped along the way to visit the Cape Coast castle and explore the area. There is so much to see, just walking around the city and other villages. It can be quite overwhelming at first, as everyone tries to sell you things on the street, but I didn’t feel unsafe. A highlight of the trip was definitely a visit to the Kakum national park and canopy walkway. We got there really early so we got to do the walkway alone and really appreciate the serenity of the jungle.